A luxurious mattress hand-crafted in the USA. Our premium quilted top layer combined with a layer of comfort foam gives that “hotel feel” the moment you lay down. Our support foam layer, on top of an individually wrapped innerspring core, gives your body and back the support needed to wake well-rested. It's the best of both worlds. Our mattresses are eco-friendly and handcrafted in the USA without harmful chemicals or toxins. The Aviya mattress works with all beds. Whether you have a standard bed, slatted bed or adjustable base, the Aviya will help you sleep better. FREE shipping is available on all Aviya mattresses. With our free shipping option, our delivery team will bring the mattress inside your door. We also offer white glove delivery where we will set up your mattress ($99) and set up + old mattress removal ($159) if needed. You can select these delivery upgrades during check out. Our unique blend of foam and innerspring core make for a mattress that allows airflow and sleeps cool all night long. 3" of foam surrounds all edges of the mattress so you can sleep edge-to-edge on the aviya, making our mattress feel bigger than the competitors. Mouseover the numbers below to learn more about each feature. Thanks to our premium quilting combined with a 1" layer of high-density breathable comfort foam, you'll sleep cool all night. Sayonara to sags! A layer of high-density foam resists sags and provides years of comfort and stability. Another layer of high-density foam provides long-lasting comfort and stability. No more sleeping in a body-shaped indentation! A third layer of foam enhances lumbar support and body support for all your pressure points. Our 3" thick foam edging encases the entire mattress allowing you to sleep edge-to-edge for a larger feel. No more rolling off the bed or not being able to use the entire sleeping surface. Our individually wrapped innerspring core is the best, and most expensive, innerspring core available using 15-gauge steel. We've even added a more solid set of springs in the middle of the mattress where support is most needed. A 1" thick stability layer helps transfer weight and energy evenly and provides the ideal sleeping surface from bottom up. Our premium foundation is made with quality wood and features 12 stats. The foundation comes split for a queen and king with both 5" and 9" height options. Add to your order for just $249. Aviya's premium quilting combined with a 1" layer of high-density comfort foam provides you the initial "oh! That feels good!" moment. Designed to breathe, you'll sleep cool on your Aviya all night long. Another layer of high-density foam provides long-lasting comfort and stability. 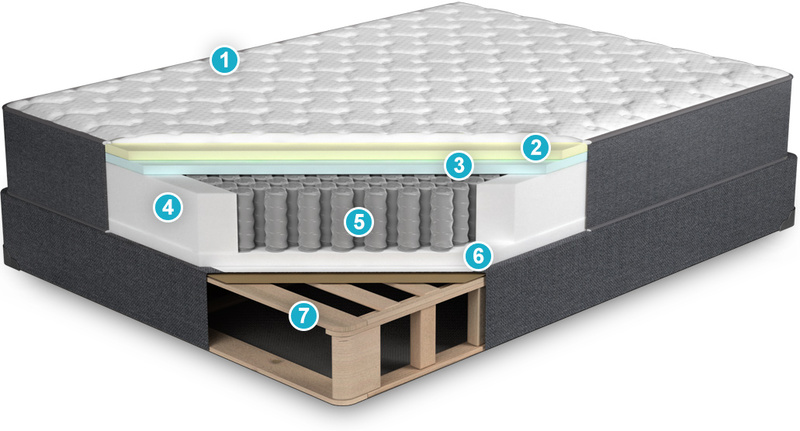 Our foam layering system ensures a no-sag mattress for years to come and reduces permanent indentations. Our 3" thick foam edging encases the entire mattress allowing you to sleep edge-to-edge for a larger feel. No more rolling off the bed or not being able to use the whole sleeping surface. Our individually wrapped innerspring core is the best, and most expensive, innerspring core available. All coils use 15 gauge steel. We've even added a more solid set of springs in the middle of the mattress where support is most needed. Our premium foundation is made with quality wood and features 12 stats. The foundation comes split for a queen and king with both 5" and 9" height options. Mattress Clarity reviews the Aviya mattress. Sleep Sherpa reviews the Aviya mattress. Aviya mattresses have a 100 night trial. Love it, or send it back. I highly recommend Aviya mattress. More companies should be like them - high quality mattress, low overhead, fair price = happy customers. It's not brain surgery! Thank you Aviya! I was cautious at first because I was unfamiliar with the Aviya brand, but I bought a queen luxury firm to give it a try. I'm sleeping like a baby now! I was pleasantly surprised with the quality of the mattress and foundation, it's heavy duty. Glad I made this choice over the big brand names. I highly recommend. Amazing! !Absolutely Love it! You guys have made a great mattress. It's the best, greatly improved my sleep. Thanks so much. I purchased my mattress on Amazon because I had an Amazon gift card. I was really happy to find out aviya sells on their website and amazon, too! The mattress has been perfect for my wife and me. She sleeps on her stomach, and I'm more on my back, but the luxury firm is ideal for both of us. Super happy we made this decision. So after having four mattress sets in 8 years of marriage my wife and I were at our wits end! Tried the memory foam fad, innersprings, then even individual side firmness innerspring. I began looking online at the Saatva mattress. Then looking at the Ghost Beds. But after weeks of looking and researching I settled on the Aviya and am so glad I have. I am a big guy 325-350lbs stomach sleeper and the king size luxury firm is the best bed I have ever slept in hands down. My wife (140lbs) back sleeper loves it just as much. Cant speak to the longevity of the mattress yet but expect it will hold up well as it is clearly made very well. If you go elsewhere to buy a mattress I really feel you will miss out on something really great so do yourself a favor and at least try it! Troy, OH Actual customer! Our most popular option is the "luxury firm" with over 80% of customers choosing this option. For those who like a softer feel. Generous layers of plush foam allow you to settle into the mattress surface. You will feel more “in” than “on” this bed but will still have strong core support. Our most popular firmness choice, this bed is quite simply not too hard and not too soft. The feel is slightly firm with a plush layer between you and the supportive core. It would remind you of that great bed you enjoyed at a fine hotel. This bed is for those who like a firm, but not rock hard mattress. Very substantial feel with minimal surface give. You will feel more “on” than “in” this bed. Important: Please place an order for your foundation at the same time as your mattress in order to receive FREE shipping on both your mattress and foundation. The Aviya foundation features the same superior construction and quality materials as our mattresses. We use premium, environmentally sustainable, Amish crafted wood components featuring twelve (12) 2.5” wide cross slats (in queen), heavy duty corner blocks and a strong center support rail. The Aviya foundation will provide the proper level of support for your new Aviya mattress. Our foundation is available in two height options at no difference in price - a standard 9” and a low profile 5”. The choice is purely aesthetic and will reduce the overall finished height of your mattress set by 4". All queen, king and California king sizes are split foundations, or two parts, for delivery purposes. Twin, twin extra long, and full size foundations are delivered in one piece.